Christmas Day is celebrated on 25th of December annually. 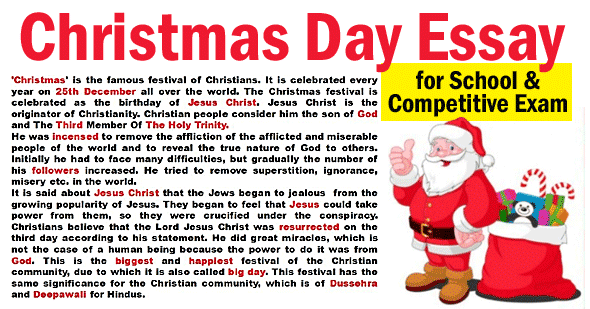 It is the biggest festival of Christians. It is celebrated with great passion like Diwali and Eid. 25th December is the date when Jesus Christ was born but there is no mention of December 25 in the Bible and most historians actually believe he was born in the spring. 25 December was probably chosen because it matched with the ancient pagan festival Saturnalia, which celebrated the agricultural god Saturn with partying, gambling, and gift-giving. It is like Krishna Janmashtami of the Hindus. All the Christian nations around the world celebrate this festival with joy and enthusiasm. Before coming to Christmas Day great preparations are made. All houses and churches are whitewashed. They are decorated with buntings, flowers and pictures. All people of Christians whether they rich or poor enjoy this festival. Christmas tree is planted by the Christians on this day. They cut the branch of a tree and plant it in a corner of the house. Then they decorate this tree with lamps and toys and flowers. This tree looks very beautiful at night. All the members of the family sit together and sing prayers in praise of Lord Jesus. People give Christmas gifts to each other. Christmas greetings and beautiful Christmas card are sent to friends and relations on this occasion. People organized a feast. It comprises the finest things that they can afford. The women of the house put on her best dress moves about with great joy and enthusiasm. After the feast people take part in dancing and singing. Most of the Christians, drink a little wine on occasion. They dance in pairs, holding hands of each other. Along with elders the children also do the same. When the function comes to end late at night, all people gather in the Church and pray to God. They pray that they may lead a happy life in the coming year. It is considered by Christian that Lord Jesus was the sun of God. God sent him to save the people from sin and misery. The people think that all those who have faith in God be saved from the sin. Thus this festival teaches them and their children to live a noble life of prayer, love and sacrifice. This festival celebrated with fun and laughter. People learn the value of love and sacrifice from this festival.